"I just wanted to say a huge thank you for the quick and awesome service I received. Friends of ours recommended Sports Safari to us as being really reliable so we tried it ourselves and just goes to show it is so true. I ordered my Hoodie on Friday 7th June and bam it’s here first thing this morning -now that is awesome - can't wait to do more shopping through Sports Safari." "The best range of NRL product I have seen!!!!!" "Great prices on footwear. Very knowledgeable." "OMG the best selection of darts ever!!! Everything from dartboards, to mats, to shafts, to lighting systems. Very knowledgeable too." "Great selection of top-end squash and tennis rackets!!!" "Heaps of variety in footy boots. Awesome prices!" "They cater for big feet - US16!! Good selection in my size. Will be back that's for sure." 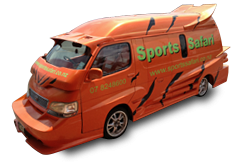 "Fast delivery with the courier service they use and really nice people to deal with."